More File-Sharing. More Media. More of Everything. Xcelerator is a reliable download-accelerator patch built for the ultimate download performance. In spite its very small size, Xcelerator brings high-tech architecture to add extra accuracy and speed to searching, sharing and downloading, with perfect integration into the native file sharing client. Through this addition to your software arsenal you’ll finally get a proper management of the bandwidth of your Internet connection – a powerful combatant of slow downloads, disconnections and traffic congestion. 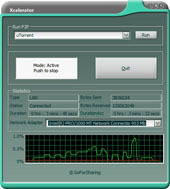 Xcelerator comes exceptionally equipped in terms of features such as automatically resumes interrupted downloads, automatically performs checksum check up to prevent corrupted downloads, files completely downloaded or incorrect are removed automatically, facilitates multiple searches, configuration from last run is saved and auto loads at system start-up, a system tray icon. Besides the above mentioned features, Xcelerator’s interface makes the program easily-manageable and shows useful information about your Internet connection, duration of acceleration, profile, the number of bytes sent and received and more. Xcelerator is offered FREE of ADWARE or SPYWARE! P2P client such as LimeWire, Shareaza, BitTorrent, uTorrent installed. Automatically performs checksum check up to prevent corrupted downloads. Files completely downloaded or incorrect are removed automatically. Configuration from last run is saved and auto loads at system start-up.